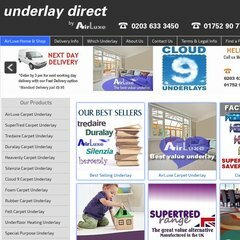 Topics: T And C's, Accessories, Felt & Combi Underlays, Foam Carpet Underlay, and Laminate & Wood. The site is programmed for ASP.NET. It is hosted by Iomart Hosting Glasgow (Scotland, Glasgow,) using Microsoft-IIS/6 web server. Its 2 nameservers are ns1.namecity.com, and ns2.namecity.com.